Panels Sponsored by The Cleveland State University Alumni Association, the Cleveland Marshall College of Law Alumni Association, Donna Caputo Ramsey LLC, and our media sponsor LawInSport. The event will host a unique four-panel set that will cover a wide range of topics including the Evolution of Player Safety in Professional and Amateur Sports, a Legal Snapshot of the Entertainment Industry, Ethics in Collegiate Athletics, and the world of esports. CLE Credit: 4 CLE hours, including 1 "Professional Conduct" credit, pending approval. The Symposium will run from 12:15 p.m. to 5:30 p.m., with a reception to follow until 6:30 p.m. Check-in will be from 12:00-12:15 p.m., and the program will begin promptly at 12:15 p.m. Please allow at least a 15-minute window to provide time to register, find your seat, access the Wi-Fi network, and take care of any other administrative or logistical needs. Sophie Gage, Counsel, Business and Legal Affairs, NFL Players Association. This panel will focus on the Evolution of Player Safety in Professional and Amateur Sports, including the comparative regulations of player benefits in the NFL, NBA (as agreed upon in their collective bargaining agreements), and the NCAA; how those regulations have developed throughout the 20th century; injury ates and policies amongst the leagues; health benefits and compensation for such injuries; and much more. This panel, which is set up as a legal snapshot of the entertainment industry, will focus on the newly passed Music Modernization Act, becoming an entertainment lawyer, ethics of an entertainment attorney, music publishing 101, the basics of recording agreements, and song writes and song rights: what is songwriting and who owns what rights in songs created by collaboration. Ricky Volante, Chief Executive Officer, The Historical Basketball League Enterprises, Inc.
Patrick Hruby, Contributing Writer to Media Outlets including The Atlantic, ESPN the Magazine, The New York Times, and the Washington Post. Our third panel will discuss pertinent ethical issues in collegiate athletics. These issues include navigating legal ethics issues within collegiate athletics regarding amateurism and influence from professional sports; concussion litigation against the NCAA and its member institutions; and the Department of Justice investigation into college athletics. Our last panel will discuss esports, also known as professional video gaming, and its emerging role in the entertainment and sports law domain. This panel will cover areas such as players’ rights, ownership of intellectual property, league regulation, and franchising. Students and C-M Law Faculty (any and all students in any and all programs) free: must show student ID at check-in. Cleveland-Marshall College of Law is located at 1801 Euclide Avenue, Cleveland, Ohio 44115. The Moot Court Room is on the first floor of the Law School, adjacent to the Atrium. If you enter through the entrances off of Euclid Ave. or East 18th St., you will need to go up one floor. 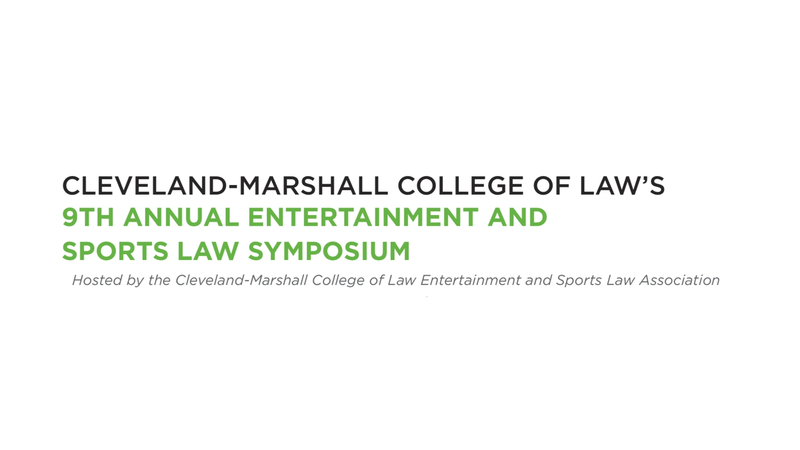 For those attending, neither the Entertainment and Sports Law Association or Cleveland-Marshall College of Law are resposible for lost or stole items left.